Pat Maroon has been activated from injured reserve after missing the Blues' last four games with an upper-body injury. 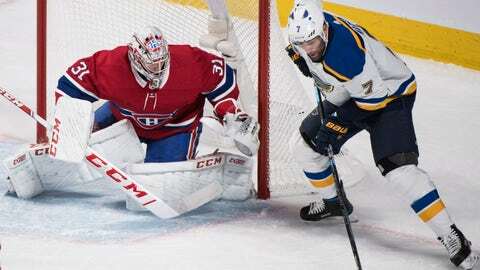 ST. LOUIS — After a week of bad injury luck, the St. Louis Blues are slowly getting healthier, though with the roster move they made Friday morning, it’s a certainty that they’ll be without one of their most important offensive contributors for at least one more game. The team announced prior to Friday evening’s game against the Predators that forward Pat Maroon has been actiavted from injured reserve, while forward Jaden Schwartz has been placed on IR with an upper-body injury. Maroon had missed the past four games with an upper-body injury but is expected to return on Friday night against Nashville, while Schwartz has missed the past three and will miss at least Friday night’s game while finishing up the minimum seven days a player is required to sit out while on IR. The 30-year-old Maroon has dressed 14 games for the Blues this season, recording seven assists. The St. Louis native has tallied 185 points (78 goals, 107 assists) and 464 penalty minutes in 389 career NHL regular-season games. Schwartz, 26, has dressed in 15 games for the Blues this season, collecting two goals and seven assists. The 2010 first-round pick has collected 280 points (115 goals, 165 assists) and 107 penalty minutes in 395 career regular-season games, all of which he has played wearing the Blue Note.